Do you know a female artist, named Tujiko Noriko? She debuted on an Austrian experimental label, Mego in 2001. Now she lives in Paris but works world wide. She has been participating in several international festivals such as Transmediale in February, Sonar and Mutek. As the first place of her Japan live tour, she chose Soso in snowy Sapporo on March 20th. When I stepped into the venue, the place was already filled with feverish excitement as the audience waited for her. Meanwhile, Tujiko Noriko, the main act of the day looked very relaxed drinking beer. All lights were turned down and a man appeared on the stage. 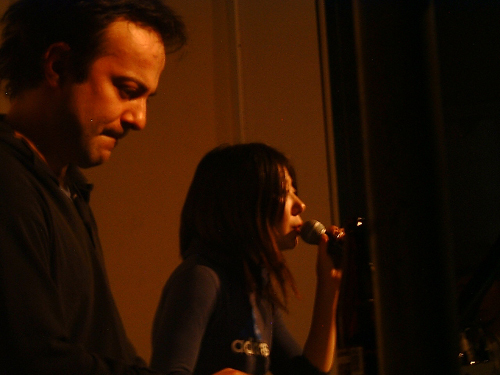 He is Lionel Fernandez from Discom who accompanied her as a support member for this tour. 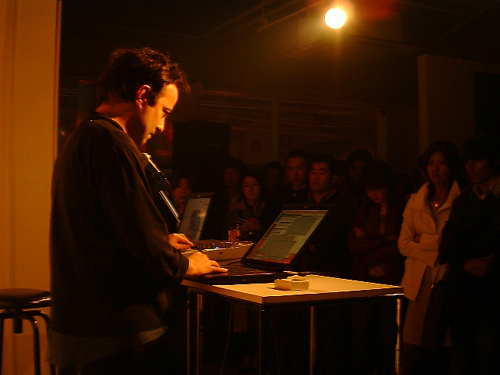 As his profile says “hard digital noise making full use of MAX/MSP”, he played a performance with one lap top. His 20 minute performance consisted of hard noises. Some people were intoxicated with the noise with their eyes closed, others sat down on the floor escaping the sound from the speakers. After a short break, when our ears became flat, she appeared on the stage in casual clothes. 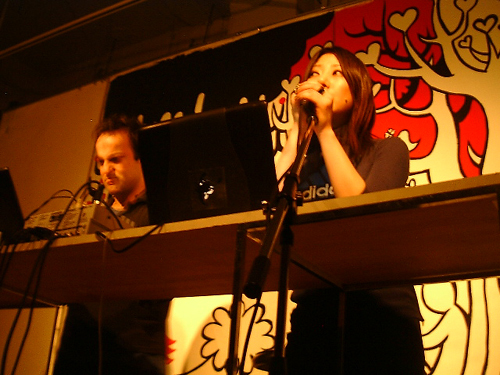 The first track was melodic in contrast to the former session and as the live went on, noisy and broken track and her clear vocal brought a unique and other world sense into the space. Back track which was full of noise and the distortion produced by Lionel merged with her vocals as if a toy box was turned around. Her voice and lyrics were voluptuous but also innocent. What surprised me was that even though there wasn’t any vocal effect in the live system, her vocal wasn’t inferior to the one on her CD, or rather, it was clearer than that of the CD. I strongly recommend you to go to her live if there is an opportunity. Close to the end, she sung some tunes solo and livened up the space. The last three songs were the most moving and the greatest. The world brought to us by her unique lyrics is one of her attractive points. Words produced from her unique sense sometimes surprise us and reach our heart. Apparently, she had been away from music for a while and worked on a film as a scenario writer and a director. Any specific schedule hasn’t been set yet but she is thinking of holding a screening event of the film. It must be an interesting work as long as I imagine from her sense of music. It is a great news for her fans that she is going to release a new album in the fall this year. We should keep our eye on Tujiko Noriko. 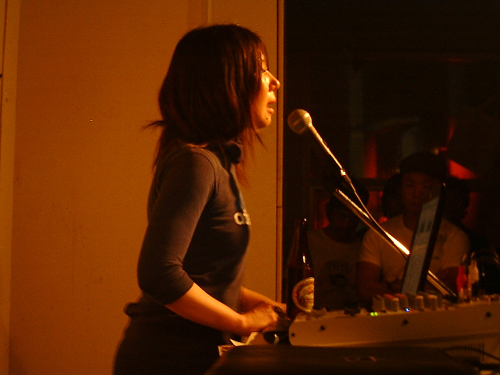 Tujiko Noriko: Made her debut with the Austrian label Mego with a release of “Shojo Toshi” in 2001. Her beautiful vocal which drifts around a collage of electronic sound has won a great acclaim from music lovers in the world. In 2002, she released “Make Me Hard” from Mego, followingly, “From Tokyo To Naiagara” from a German label Tomlab, inviting Akira Onda as a producer, Ryo Arai and Yumiko Ono from Buffalo Daughter. Discom: French lap top duo of Lionel Fernandez and Eric Minkinnen. Their first album “Smuglo” released in 2001 has got a great acclaim from the various field and been getting popularity as post-Mego or Oval in Europe. (Pita mentions it’s the best album in his life and loves them very much) Their sound is unique and radical merging hard digital noise making full use of MAX/MSP and contrastive pop harmony. *Tunes by Noriko Tujiko can be listened and purchased from Amazon.